Visitors to Tallahassee looking west on College Avenue are afforded a sweeping view of a building considered to be the “architectural center piece” of Florida State University. (1) Sitting high atop the beautiful red hills that make Tallahassee famous, the Westcott Administration Building, completed in 1910, houses the administrative offices of university staff including the President and Vice Presidents. From the street, this spectacular building and its famous fountain are framed by two brick columns spanned by an iron arch that today reads, Florida State University. Architect, William Edwards of the South Carolina architectural firm, Edwards and Walter, was responsible for the design of the piers(3). Edwards served as architect to the State Board of Control from 1905, until the 1920’s(4). As board architect, Edward was responsible for the design of many of the early buildings of the Florida State College for Women. His works include Reynolds Hall (1913), Broward Hall (1918), and the Education Building (1918), known today as the Psychology Building(5). 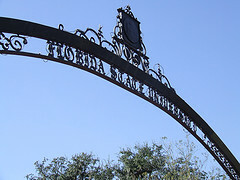 The steel archway spanning the two brick piers was originally inscribed with the name, Florida State College for Women. 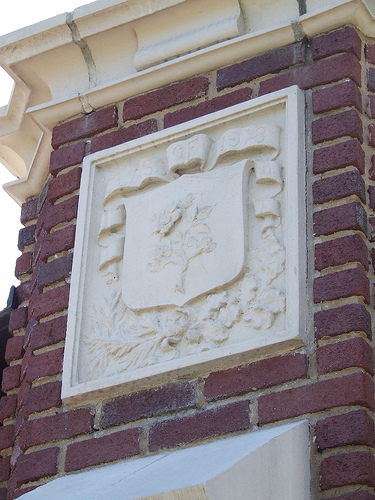 A medallion bearing the State Seal of Florida still rests in the center of the arch. 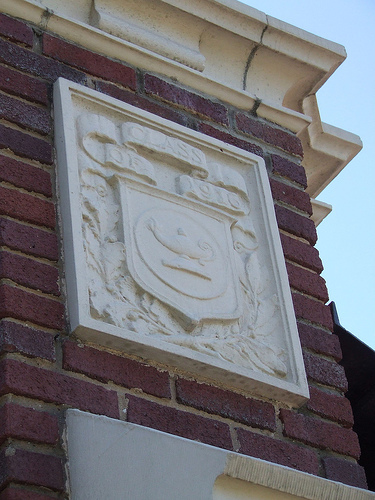 In 1947, the Florida State College for Women inscription was removed from the arch and replaced with Florida State University, signifying the change to a co-educational university. 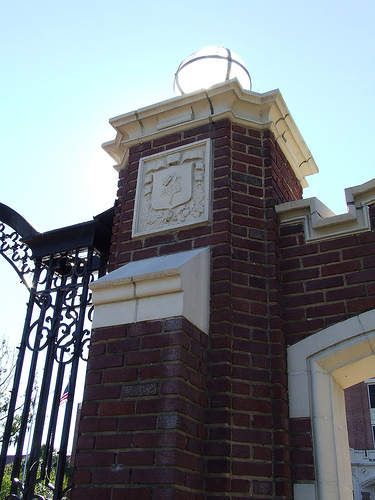 The construction of the gateway was completed by Tallahassee contractor, O.C. Parker, in 1916(6). When the campus was closed, college officials had a chain stretched between the two piers to serve as a makeshift gate. Realizing that the use of the chain was an insufficient solution, President Edward Conradi had steel gates constructed and installed by H.H. Brown of Dothan, Alabama in 1924. In 1964, new gates were designed and installed after the piers were widened and today the gates have been removed completely(7). 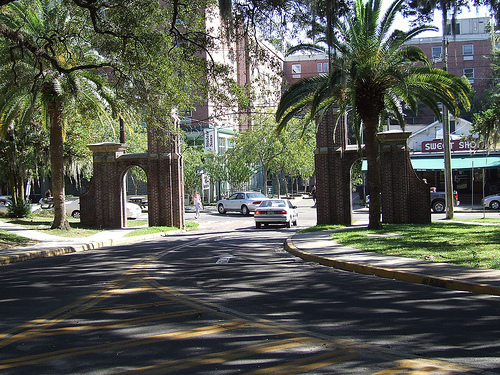 Just outside of Gilchrist Hall is the southern entrance to Florida State University. 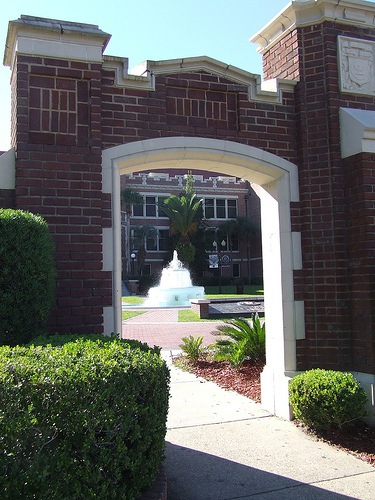 The gateway, with its collegiate gothic architecture, was constructed in 1933 as a gift from the Florida State College for Women’s classes of 1933 and 1935. Designed by Herbert C. Mendenhall, campus engineer, the gate is consistent with the collegiate gothic architecture prevalent throughout campus(8). In addition to the south gate, two other gates, one located to the west and one to the north, were constructed as part of the class gift. The construction of these three gates, in addition to the gate at the main entrance, allowed the college to completely close the campus to automobile traffic(10). This was important to the FSCW administration who continued to hold onto strict rules and regulations in order to protect the female students from outside influence(11). the gates erected at the three new entrances to the campus(12). 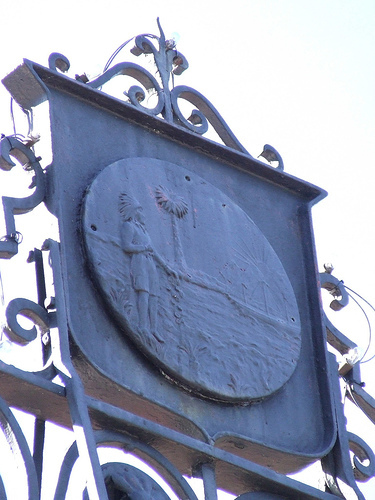 Today, the south entrance stands as the only remaining gate of the three gates constructed in 1933. (1) University Relations, Florida State University, “Florida State University Legacy Walk,” Florida State University, http://www.fsu.edu/~legacy/ (accessed September 20, 2006). (2) Sellers, Robin Jeanne. Femina Perfecta: The Genesis of Florida State University. (Tallahassee, FL: FSCW/FSU Class of 1947, 1995), 40-41. (4) Kerber, Stephen. “William Edwards and the Historic University of Florida Campus: A Photographic Essay.” Florida Historical Quarterly57, no. 3 (January 1979): 328. (5) Board of Control. Minutes of the Meeting of the Board of Control, Series 1, Volume 2 (April 8, 1912). State of Florida. p. 40.; Board of Control. Minutes of the Meeting of the Board of Control, Series 1, Volume 3 (January 14, 1918). State of Florida. p. 117. (6) Florida Flambeau, “Work on Gateway to be Commenced,” April 8, 1916. (7) State of Florida, Florida Master Site File, Survey #3004. Department of State, Bureau of Historic Preservation, Tallahassee. (8) Florida Flambeau, “Construction of Three New Gates Nears Completion,” June 30, 1933. (9)Florida Flambeau, “Plans Progress as Work Begins on Memorial Gate,” May 12, 1933.